(Upper panel) A schematic illustration of the infalling gas around the protostar. 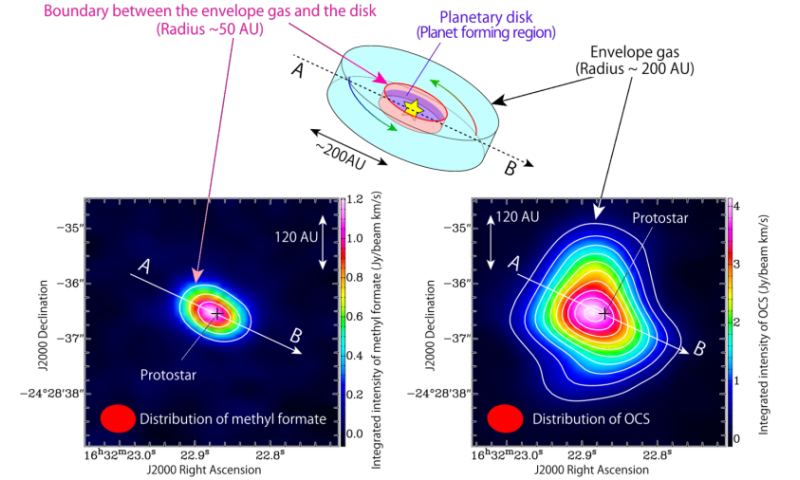 A disk structure with a radius of about 50 AU exists around the protostar. The disk in turn is surrounded by an envelope of gas extended over a 200 AU scale. OCS exists in the envelope gas, while methyl formate mainly exists in the boundary area between the envelope gas and the disk structure. (Lower left) Intensity distribution of methyl formate (HCOOCH3) observed with ALMA. A structure elongated along A-B can be seen centered on the position of the protostar. Methyl formate is located within 50 AU from the protostar. (Lower right) Intensity distribution of OCS (carbonyl sulfide) observed with ALMA. A structure elongated along A-B can be seen centered on the position of the protostar position, similar to the case of OCS. However the distribution of OCS (~200 AU) is more extended than that of methyl formate. Credit: ALMA (ESO/NAOJ/NRAO), Oya et al. More information: "Infalling-Rotating Motion and Associated Chemical Change in the Envelope of IRAS 16293-2422 Source A Studied with ALMA", Yoko Oya (The University of Tokyo), Nami Sakai (RIKEN), Ana López-Sepulcre (The University of Tokyo), Yoshimasa Watanabe (The University of Tokyo), Cecilia Ceccarelli (Universite Grenoble Alpes/CNRS), Bertrand Lefloch (Universite Grenoble Alpes/CNRS), Cécile Favre (Universite Grenoble Alpes/CNRS), Satoshi Yamamoto (The University of Tokyo) Astrophysical Journal issued on 20 June 2016.